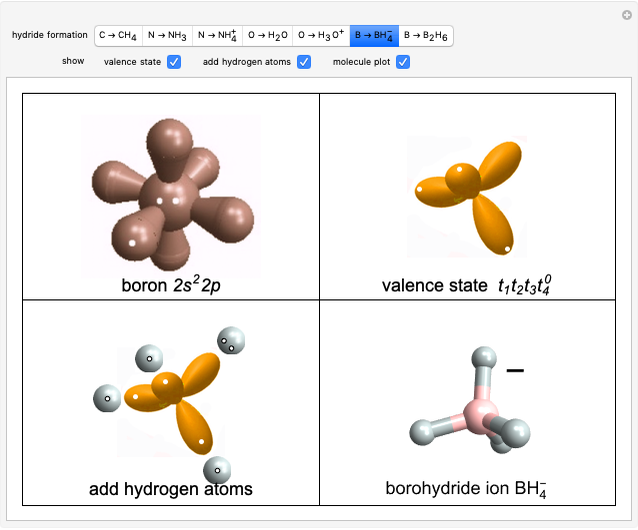 The simplest hydrides of boron, carbon, nitrogen and oxygen provide an elementary picture of atomic orbitals, hybridization and chemical bonding. The valence shells of the free atoms of B, C, N and O in their ground states have the electron configurations , , , , respectively (in addition to their inner shells). The three degenerate orbitals are singly occupied, except for O, in which one of the orbitals must double up. Singly occupied orbitals are shown lightly colored. Darker colors indicate two-electron occupancy. Empty orbitals are shown in very light outline. Carbon, with its two unpaired electrons, appears to be naturally divalent, and indeed the compound can exist in the gas phase. But much more stable compounds can be formed if carbon invests a relatively small amount of energy to excite one of its -electrons to the empty orbital, and becomes quadrivalent, thus recouping the - excitation energy with the formation of two additional chemical bonds. A further transformation, first suggested by Linus Pauling, is the linear combination of the nearly degenerate and three orbitals into four identically shaped hybrid orbitals, directed toward the corners of a tetrahedron. These are called -hybrid orbitals, which can be designated , , , . Indeed, the methane molecule formed by covalent bonding with four hydrogen atoms has a tetrahedral shape with identical angles of 109.5° between each pair of C-H bonds. Nitrogen and oxygen also tend to produce tetrahedral hybrids in what can be designated as their "valence states," a construct introduced independently by J. H. Van Vleck and W. E. Moffitt, as the conceptual precursor of bond formation to hydrogens (or other elements). Except when four identical atoms bond to the central atom, the hybrids are slightly distorted from a perfect tetrahedral shape. This picture can be subsumed by the VSEPR model of chemical bonding, in which bonds and lone pairs of electrons adopt a configuration determined by their maximized repulsions. Nitrogen expresses its natural trivalence to form the ammonia molecule . It still has an approximately tetrahedral structure, with a lone pair of electrons occupying one of the vertices. The N-H bond angles are reduced to 107.8° because the lone pair repels the N-H bonds. Adding an additional proton produces the ammonium ion N , which is again a regular tetrahedron. The best-known compound of oxygen and an essential for life is, of course, water, O, which forms two bonds to hydrogen atoms in addition to two lone pairs. The H-O-H angle is reduced to 104.5° by repulsion of the lone pairs. A principal component of acids is the hydronium ion , with a structure analogous to ammonia. When water is involved in hydrogen bonding, the oxygen can be dynamically surrounded by four hydrogen atoms or ions in a tetrahedral configuration. This is approximated in the structure of ice. 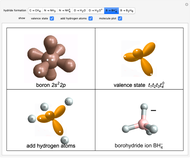 Boron is an instance of an "electron-deficient" species. The simplest hydride is borane, B , which has the expected planar triangular structure, using trigonal -hybrid atomic orbitals (designated , , ). It is extremely unstable, however, and dimerizes to form diborane, . Only the fluoride analog is a stable molecule. For the more common valence state of boron, we can imagine a tetrahedron with one empty orbital. This can also be pictured as a resonance hybrid in which the three electrons are distributed among the four tetrahedral lobes (with an average of 3/4 of an electron per orbital). This works to account for the tetrahedral structure of the borohydride ion B , which requires combination with three hydrogen atoms, as well as a hydride ion . 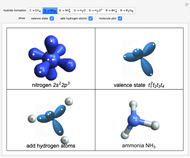 A long-controversial problem in theoretical chemistry was the structure of diborane . 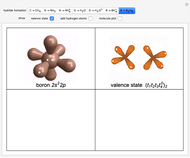 We propose the following picture, beginning with two boron atoms in juxtaposition occupying their hypothetical valence states, as shown in the graphic. Four hydrogen atoms can be added "normally" to the ends of the molecule. The four remaining valence orbitals on the two boron atoms, having only two electrons between them, can then be imagined to form four one-electron bonds with two hydrogen atoms. This produces a unique bridged structure, which has been amply verified experimentally. One-electron bonds are known to exist, for example, in the molecule-ion. Alternatively, the two B-H-B bridges can be classified as 3-center, 2-electron bonds. S. M. Blinder, Introduction to Quantum Mechanics, Amsterdam: Elsevier, 2004 pp. 142-143. S. M. Blinder, "Structure and Bonding of Second-Row Hydrides," World Journal of Chemical Education, 5(6), 2017 pp. 203–205. doi:10.12691/wjce-5-6-3. S. M. Blinder "Structure and Bonding of Second-Row Hydrides"